Cook like Priya: Badam Halwa | Badam halwa in packets | Badam ka Halwa - Celebrating 3 beautiful years! 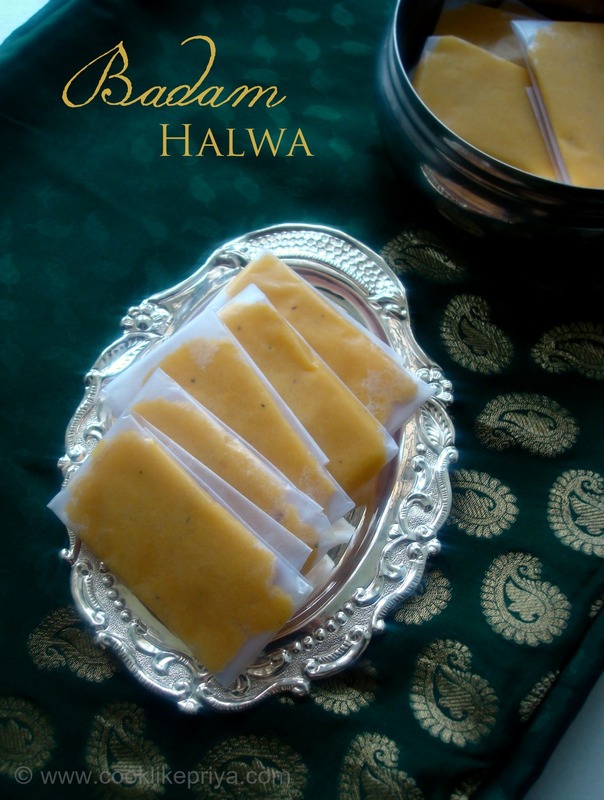 Badam Halwa | Badam halwa in packets | Badam ka Halwa - Celebrating 3 beautiful years! Another year & another reason to celebrate life with my beloved. Its been three years since we said 'I do' and its truly special day for us this year since we had the privileged to celebrate this day with both our parents. I prepared a feast for them and my dad and mom were sure so very happy and excited to sit and enjoy a full spread meal served by their own daughter. I consider this a great thing since its hard to do something like this atleast for me. And of course my husband enjoyed the feast and kept telling my dad ' How is my wife's cooking' :P sometimes I get stuck between these men and their talks. Nevertheless this year was sure special and will carry this memory for a lifetime. So among the feast that I had made Badam Halwa was on the top list. 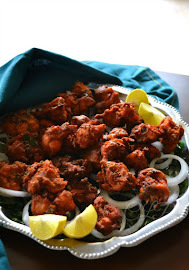 I served it along their lunch menu of Mutton Biryani, Brinjal Salna, Onion Raita, Tandoori Chicken legs, Boiled eggs, cucumber carrot salad and Cake for dessert. Since I was preparing a huge quantity I specified with few dishes so that I would not delay in serving everyone warm food. The cake recipe will be up next on blog so so look out for it. Badam Halwa to me brings back fond childhood memories, my parents were part of this yearly club where we spent most weekends and even for lunch/ dinners. And one of the specialities of the club chef was Badam halwa. This melt in mouth sweet is wrapped in butter paper and no one can be satisfied with just one ;-). So I made sure to do more than required since I knew this is our family favourite. There are couple of versions to make badam halwa but this version is best for wrapping them and also serving them as it is. 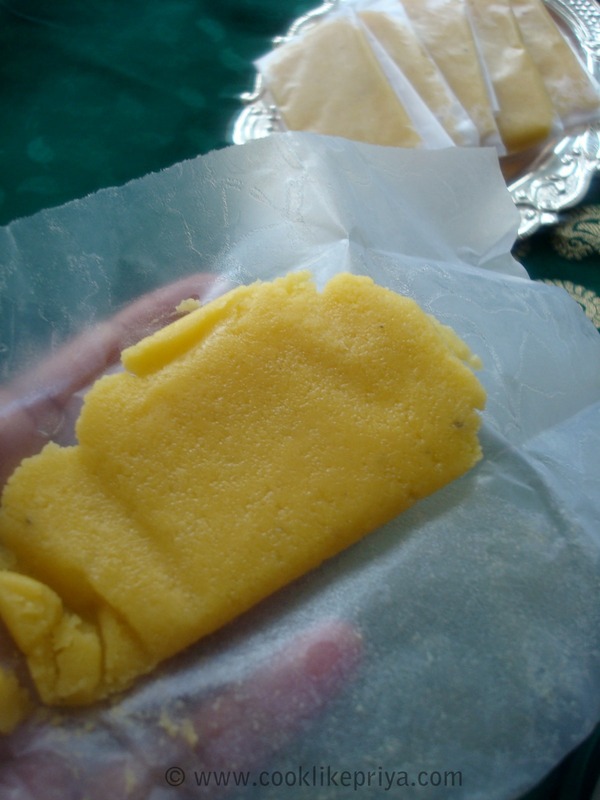 But there is something about wrapping them in butter paper, I found the secret it keeps the badam halwa nice and moist. Since its a milk based sweet make sure to enjoy them within 4 days (incase it lasts that long ) ;-). Family Verdict - Its perfect in sweetness and far better than the sweet shop version of loaded ghee. 1. Soak badam overnight or for 4-5 hours in water. Alternately you can boil badam for 20 minutes and later peel the skin. Make sure you soak for enough time else it will hard to peel the skins. 3. 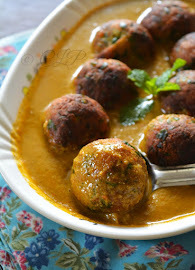 No add sugar, food colour, cardamom powder, saffron (if adding) or saffron essence and condensed milk and keep stirring the mixture until it thickens. After 3-4 minutes the mixture starts boiling. The bubbles become bigger and thickens. Keep stirring continuously to avoid the mixture from getting burnt. 4. Now the badam mixture starts thickening and the bubbles become smaller. Now add the ghee 2 tbsp and mix well. You will find the mixture leaving the sides of the pan (3 mins). Mix for two minutes and switch off. Now grease a plate with ghee and transfer the mixture to the plate. 5. Now cut butter paper into rectangle strips and once the badam halwa is easy to handle. 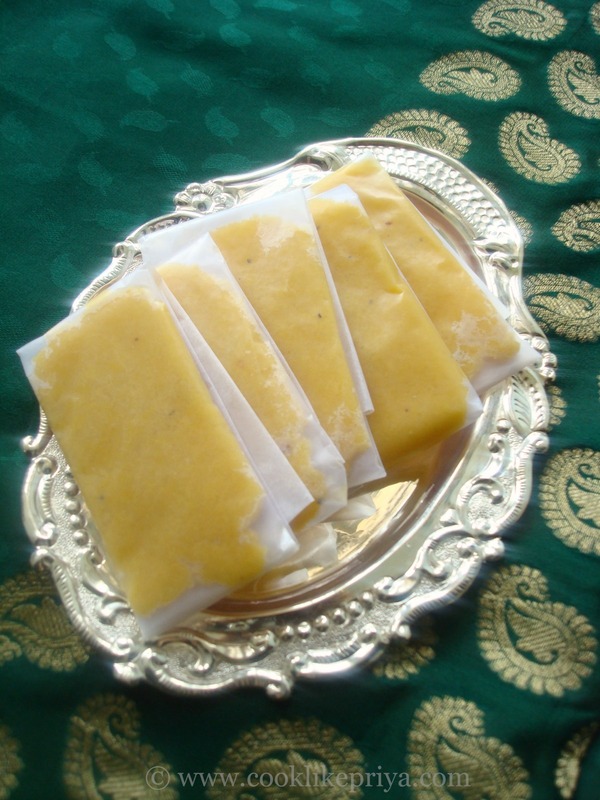 place 1 tbsp of badam halwa and wrap the butter paper into packets and place on a plate to cool down. 6. Serve once it comes to room temperature. 1. The texture of this badam halwa is soft and moist and not firm and hard like the sugar syrup method. 2. You can add 2 tbsp of cashew too along with badam and grind to get a more flavourful badam halwa. 3. If you add only yellow food colour the halwa will look pale adding a pinch of orange food colour balances the badam halwa colour well. 4. 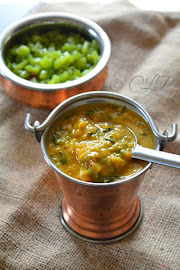 I strongly recommend using condensed milk it adds flavour and helps in the texture of badam halwa. 5. You can reheat the badam halwa before serving, if you love to enjoy them warm. 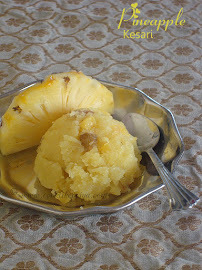 Congrats dear....Badam halwa looks really tempting...so soft & melt in mouth..
Halwa looks so tempting,,.... Love it!! congratulations and many more to come. yummy sweet to celebrate. wow such an delicious and yummy halwa :) you have made them just perfect !! lovely treat for the big day , parcel me some !! Congratulations on 3rd Anniversary, What a perfect way to celebrate with Badam Halwa! Perfect way to celebrate dee....love the idea of wrapping in butter paper! congrats on 3rd anniversary. All the best for many more to come. Halwa looks so perfect..
Congrats Priya on the 3rd anniversary!!! Badam halwa looks perfect and yummy. 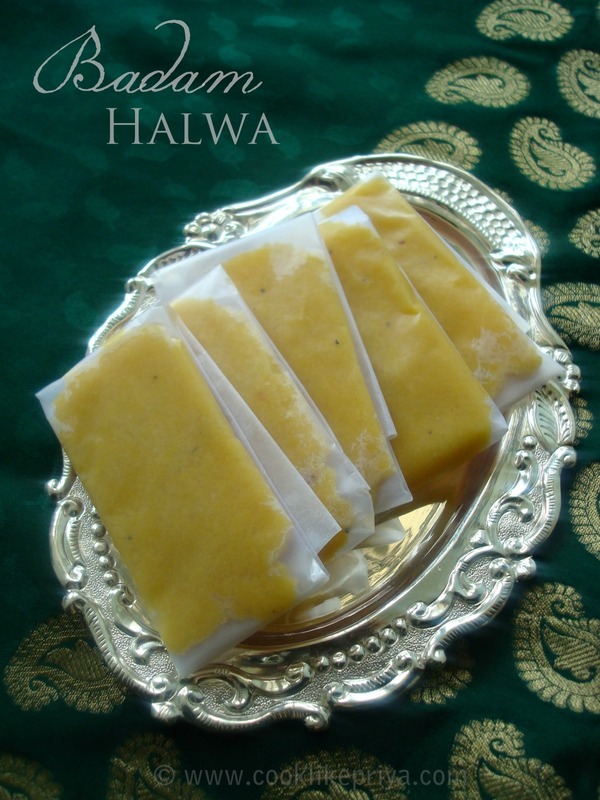 Awesome and delicious looking halwa packets. Excellent preparation. congrats dear on ur anniversary... years will fly so keep praying to the Lord to keep your marriage blessed always... :) the badam halwa looks delicious dee... seeing the list of items on the menu, i'm sure that everybody must have gone back home with a full tummy! Looking great. Royal sweet indeed. Badam halwa looks reallllly yummyyy. 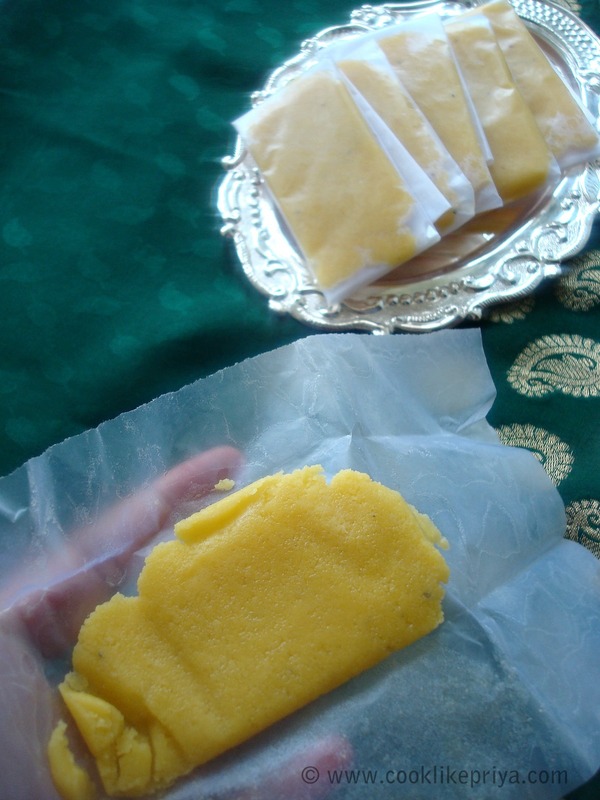 Love the idea of keeping the halwa moist with the butter paper. I think I wished u in fb but heres more good wishes sent to u Priya. My comment is lost. So Congrats and I beleive its your birthday so Happy birthday. 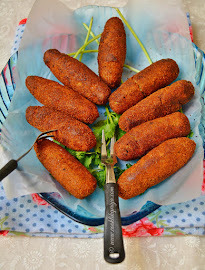 Thats soooo irresistible, god i want some rite now. Saffola Total - "protects better than olive oil"